A North Carolina history teacher is facing backlash after he stomped on the American flag as part of a lesson on the First Amendment. 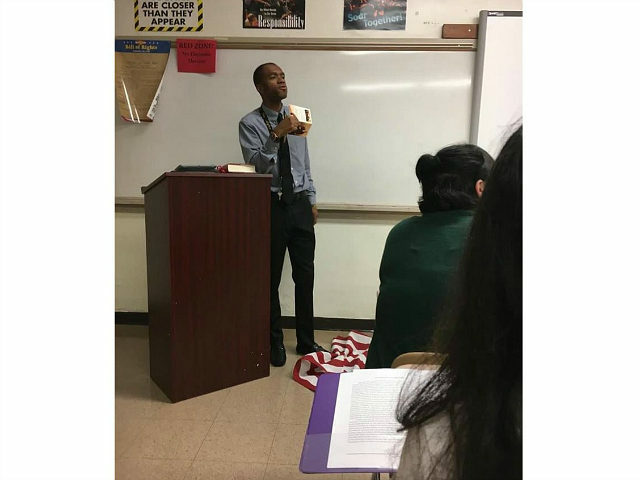 Sara Taylor, who is a parent of one of the students in that class, posted a photo of Lee Francis standing over a crumpled American flag on the floor in front of his class at Massey Hill High School that has since gone viral, The Fayetteville Observer reported. Taylor said Francis asked the students for a lighter or scissors. When no one had one, he threw the flag on the floor and stomped on it. Cumberland County Superintendent Frank Til Jr. heard of the incident Tuesday but is waiting until he has all the facts of the incident before he takes any action against Francis. “I don’t want to make any comments until I get it sorted all out,” Till said to The Observer. Francis, in his defense, said on Facebook that the lesson was about Texas v. Johnson, a landmark Supreme Court case that upheld flag burning and other forms of desecrating the flag as protected free speech under the First Amendment.